Share the story of the first Christmas with your little one! A classic story of The First Chrismas travels along with Mary and Joseph to the town of Bethlehem where baby Jesus is born. 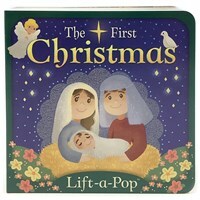 A simple story engages toddlers with lift-a-flap pages where they can learn and enjoy the traditional telling of Jesus's birth and the meaning of Christmas. Holly Berry-Byrd just loves Christmas time! And so do the writers and designers at Cottage Door Press. Holly Berry-Byrd is the name we use when we all create a Christmas book together. It (sort of) means Red Bird – like our cheery little mascot. When Holly isn’t writing Christmas books, she enjoys baking gingerbread houses, knitting reindeer booties, and listening to vintage vinyl Christmas LPs.